2500 W. 76 Country Blvd. The first 2 outer seats of each row. All seats except for the first 2 outer seats of each row. 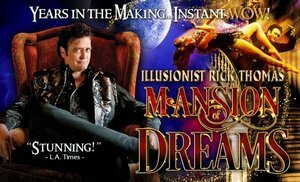 Rick Thomas is a premier illusionist having completed five world tours covering over 50 countries. High honors include the coveted “Magician of the Year” by the Academy of Magical Arts and "Stage Magician of the Year" by the World Magic Awards. Thomas has performed for 15 years in his own show in Las Vegas. Thomas has also been featured on numerous national television specials including the NBC specials "The World’s Greatest Magic" and his own special on ABC that aired throughout Asia. Thomas performs the most intriguing and innovative grand illusions in the world with a style unlike any other magical entertainer. His stage presence is unmatched as he weaves magic, music and dance into a seamless spectacle. The slick showmanship of Rick Thomas is a riveting visual delight and he is a triumph of personality and presentation!